ASUS UX490UA-XS74-BL is a mid-2017 release 14-inch portable notebook “Zenbook 3 Deluxe” with the fast seventh generation Intel i7 processor, a large size SSD storage and 2.4 lb. weight and slim chassis that makes it ideal for travelers. It will work for graphics designers, photographers, programmers, and coders. It will handle the daily internet browsing, video watching, word processing and some gaming very smoothly. Technical specs include the Kaby Lake Intel i7-7500U processor at 2.7GHz to 3.5GHz speed with turbo boost,16GB LPDDR3 memory at 2133MHz speed, 512GB Solid State Drive (NVME PCI 3.0 x4 SSD) for both great speed and adequate storage size and the 64-bit Windows 10 Pro version for traveling professionals. Royal blue Asus UX490UA Zenbook has a premium feel with the aerospace-grade aluminum and has a very modern and elegant design. It weighs just 2.4 pounds and is only 0.49 inch thick (dimensions of 8.4 x 12.95 x 0.5 inches) despite having a Full HD 14-inch display (screen is measured diagonally). It is a powerful ultrabook with an efficient cooling system by the liquid-crystal-polymer fan and the copper-alloy heat pipe and runs totally quietly at all times. 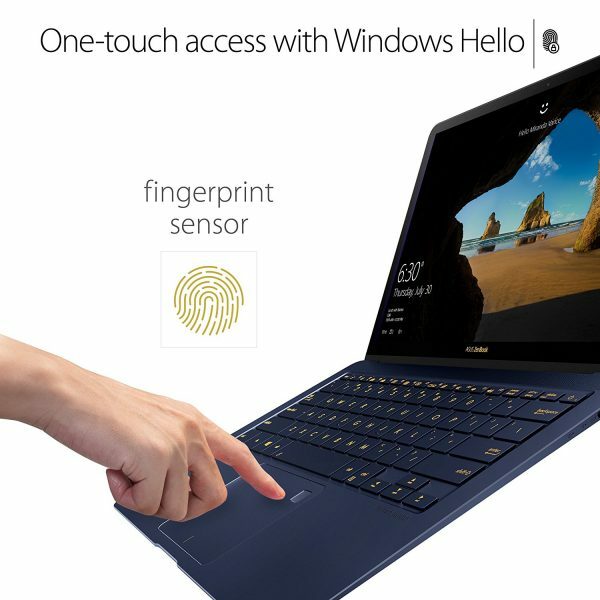 It has a fingerprint sensor on the trackpad for easy one-touch access with Windows Hello and enhanced security and privacy. 14-inch LED-backlit FHD screen with the Corning Gorilla Glass 5 offers the 1920 x 1080 pixel resolution and up to 178-degree viewing angles horizontally and vertically- keeps the amazing contrast (TV-grade 1000:1 contrast ratio) and colors (100% sRGB color gamut). It includes a decent SonicMaster Premium true surround sound system with Harmon Kardon quad speakers and four-channel smart amplifier. And there is an integrated high definition webcam with dual speakers for your live casual chats or work conferences. The super slim bezel is just 0.29 inches and the screen to body ratio is an impressive 84% which helps with the compact size of this great portable machine for frequent travelers. And the 46Whr Lithium polymer battery offers up to 9 hours of real battery life in average use, so you can be away from the power outlets all day. It even has the fast charge functionality if you get a chance at the airport when you’re waiting for your flight as it will charge up to 60% in just 49 minutes. 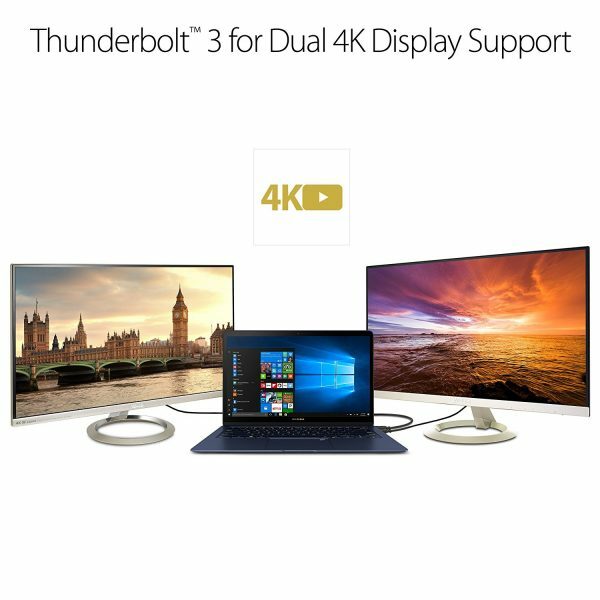 Connectivity options on the Asus Zenbook include a USB-C, a USB 3.1, 2 x Thunderbolt 3 USB-C ports for 40 Gbps speed data transfers and that support external graphics cards and dual 4K Ultra HD display, the latest dual-band 802.11ac wireless and the energy efficient Bluetooth 4.1. The full-size gold-backlit keyboard is great for accurate and comfy typing in dim light or dark and offers 1.2mm travel and it doesn’t include a separate numeric pad due to the size restrictions but a precision touchpad that supports multiple gestures with the one-touch fingerprint sensor. Asus Zenbook UX490UA-XS74-BL is not the most powerful PC ever on the market and the screen is a little glossy and dim but definitely offers a great combination of performance/speed, elegance/beauty, and portability. Due to the high price and design, there will be a certain group of customers that will consider this new Zenbook, but it can not be for everyone. It will suit the needs of those that travel a lot and want something compact, thin and lightweight, yet powerful enough to handle complex and daily tasks on the go. It is an expensive machine but sure is good value for money.